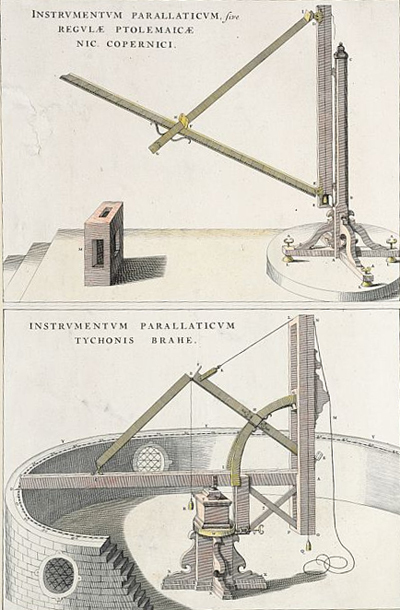 Tycho Brahe (1546-1601), a Danish nobleman and gentleman scientist, made the most precise astronomical and planetary observations to date by designing and building the best, most sophisticated scientific instruments available until the invention of the earliest known telescope in 1608. 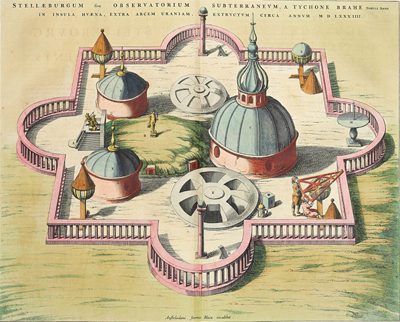 His discoveries in astronomy were made from Uranibourg, an observatory on an estate on the island of Hveen in the sound between Denmark and Sweden, which King Frederick II of Denmark had granted him, with funding as well for construction of the observatory and its instruments. 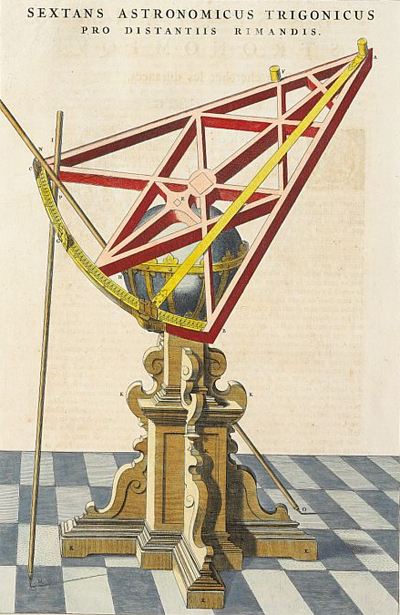 His observations of planetary motion, particularly that of Mars, provided the crucial data for later astronomers like Johannes Kepler, who was Brahe's assistant, to construct our present model of the solar system. 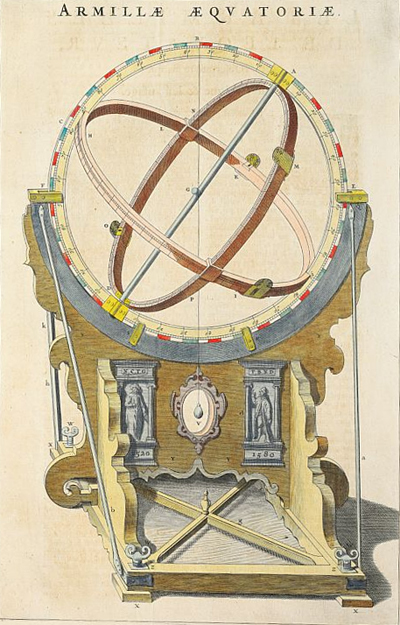 Brahe's observatory and his scientific instruments were splendidly documented by Joan Blaeu in his Grand Atlas. 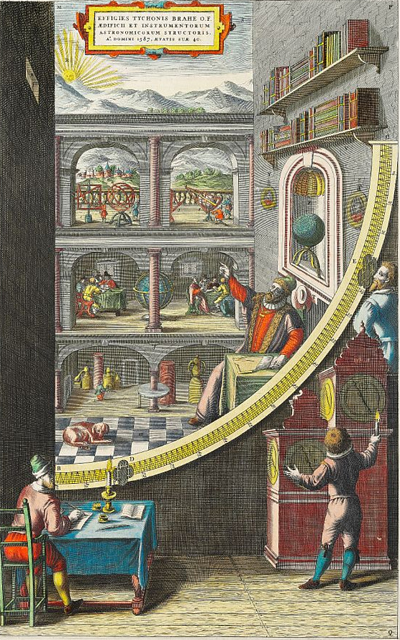 Blaeu’s magnificent hand-colored copperplate engravings were revised from wood-cuts originally published in Brahe’s own Astronomiae Instauratiae Mechanicae (1598). 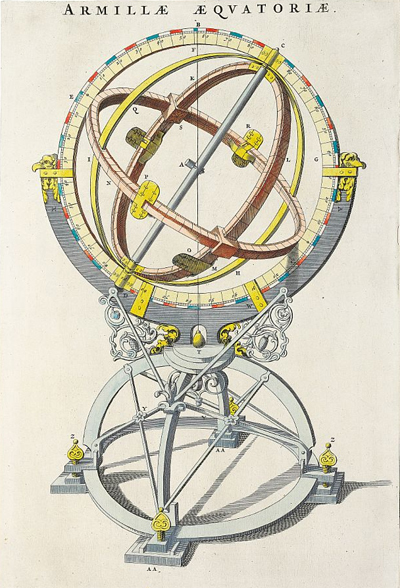 Joan (John) Blaeu (1596-1673) was born a cartographer and died as one in Amsterdam. 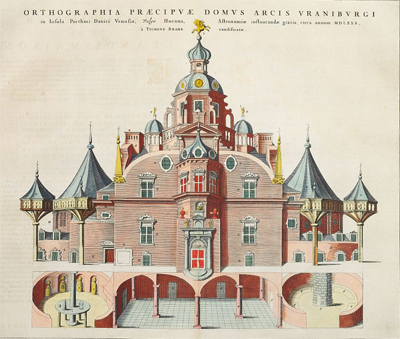 He was the son of Willem Blaeu, who established the family business as a globe and instrument maker in 1599 and soon expanded into maps and atlases. Joan shared his father's passion for this work. After Willem died in 1638, Joan and his brother, Cornelius, continued to expand the business. After Cornelius's death Joan continued to direct the work alone. 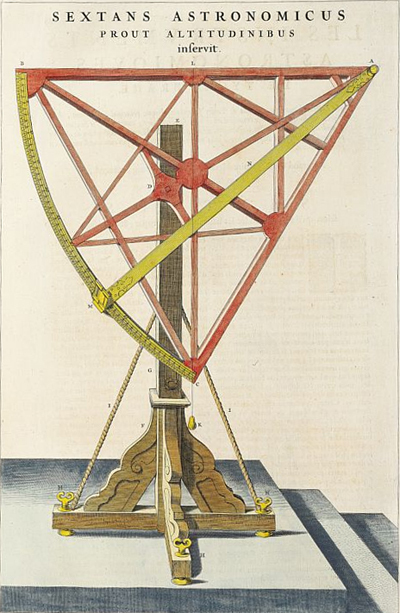 He produced a whole series of 6 volumes of maps (1655), which completed the work that his father had begun. The next, massive project resulted in the production of the 'Atlas Major', or Grande Atlas. This extended to eleven volumes (later editions ranged from 9-12 volumes), the first publication being in 1662. The work contained 3,000 pages of text and near 600 double-page maps. 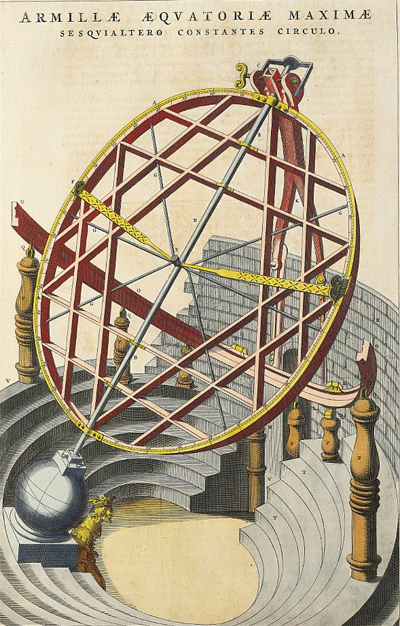 It was and remains the most extraordinary cartographic work ever produced. The engraving was exquisite as was the calligraphy, coloring, heraldic detail, pictorial work and the intricate cartouches, which dramatically added to the Grande Atlas's appeal. 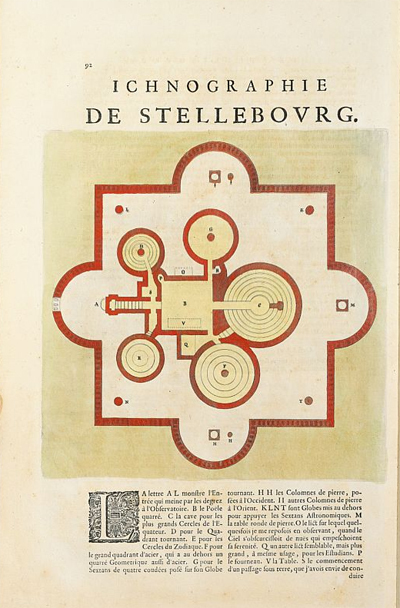 Some of the maps produced by Blaeu are considered to be the finest published during the seventeenth century. 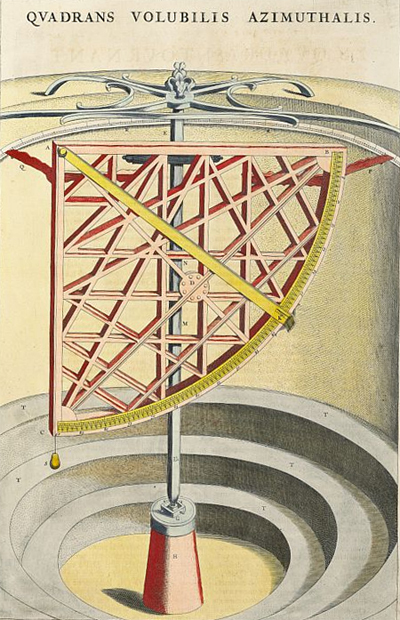 The hand-colored engravings of Brahe's instruments and observatory are unforgetable. 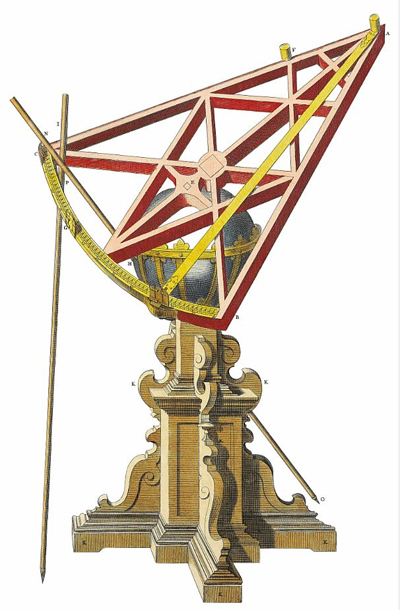 They stand out not only as sophisticated scientific instruments of the period but as works of art, bold geometric constructions that would be welcome and admired in any sculpture garden. BLAEU, Johan (1596-1673). 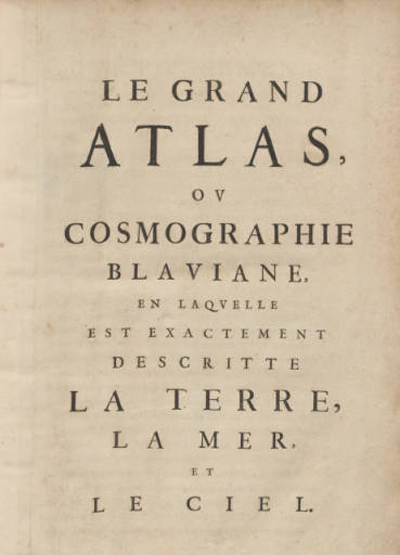 Le grand atlas ou cosmographie Blaviane, en laquelle est exactement descritte la terre, la mer et le ciel. Amsterdam: chez Jean Blaeu, 1663. 12 folio volumes. Title from half-title to volume 1. 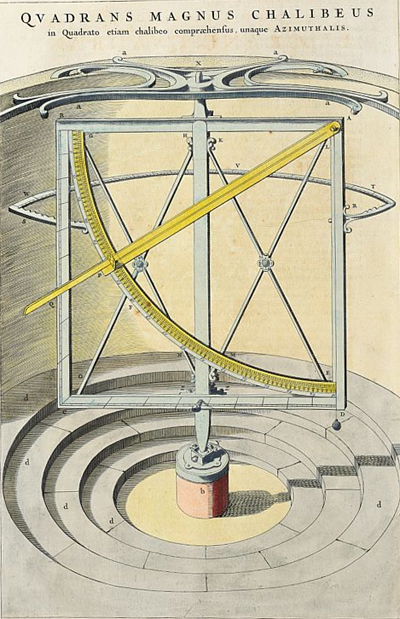 Title of volume 1: Geographie qui est la première partie de la Cosmographie Blaviane. Title of vols. 2-12: Second [etc.] volume de la Geographie Blaviane./ Vol. 1 has general half title for the complete work, and special t.p. with imprint date 1663./ Some parts have additional engraved title page, some with imprint in Latin: Amsterdami : Apud Ionnanem Blaeu, 1662. Images courtesy of Bruun Rasmussen Auctions of Denmark, which recently offered this edition of the Blaeu Grande Atlas, with our thanks.